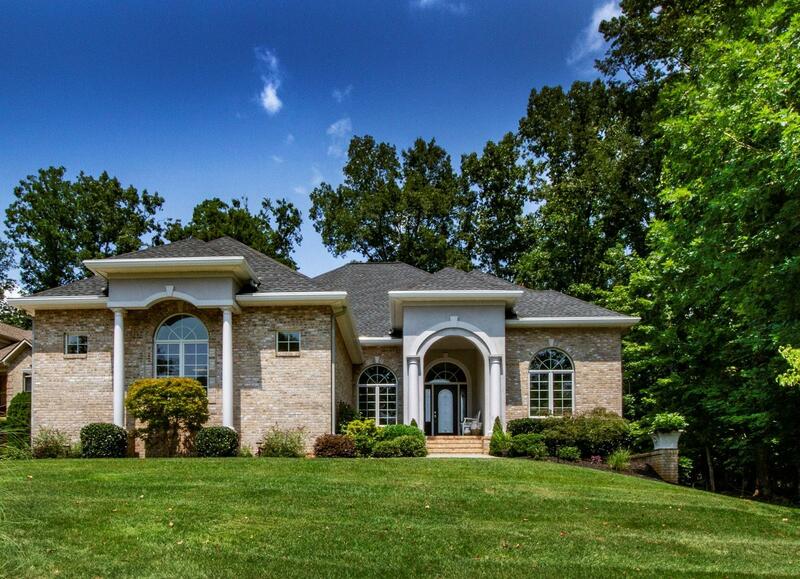 Gorgeous Brick Golf-Front Ranch Home Overlooks 12th Hole! Lake & Mountain Views Too! 3-Car Garage! Beautiful Architecture, Elegant Finishes & Very Open Floor Plan make it ''Comfortably Elegant''! 15' Ceilings & Elegant Millwork! Gleaming Hardwood & Travertine Tile Floors on Main! Peaceful Conservatory w/Wall of Palladian Windows & French Doors Overlooks Garden, Pavered Patio & Golf Course! Private Fenced Yard w/Mature Trees. Gourmet Kitchen Features Staggered Height, Soft-Close, Cherry Cabinetry w/Pot Drawers & Pull-outs; Island, Huge Pantry! Stainless Appliances include: Wolf Gas Cooktop, Double Wall Ovens & Wine Cooler! Living Room & Office have Custom White Wall Cabinetry. Huge Master w/Tiled, Door-Less Shower! Separate Guest Wing. Bonus Up. New(2018)3-Zone HVAC! Immaculate & Perfect! !